Welcome to PART 13 of the Inflammatory Bowel Disease series, where we talk to people from all walks of life with this condition; to give everyone a platform to share their story, and help to raise awareness. 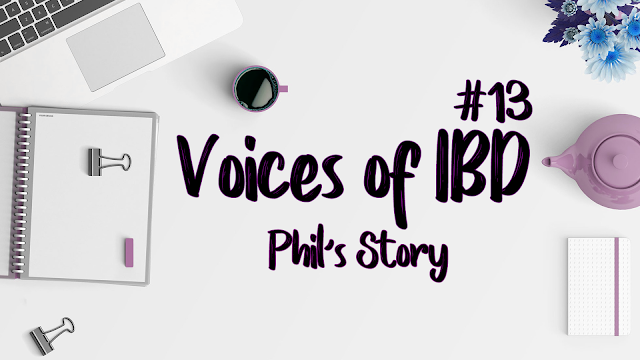 This week we talk to Phil about his battle with Crohn's Disease. My name is Phil Harris and I’m 35 years old. I am a training manager/ driving examiner for a bus company. I was diagnosed around 14 months ago. My main symptoms were severe and quick weight loss along with extreme fatigue. All I needed to do was sit down and I would be asleep. This was accompanied at the end with blood in my stools. At first, I was told it was cancer. I was placed on the 2-week cancer pathway. This was the week before Christmas, so as you can guess it wasn’t the best Xmas last year. Following all the cameras it was then diagnosed as Crohn's. So, it was a relief at first. However, I soon became to worry about the condition. Following my diagnosis, I received regular contact from my IBD nurse and with the consultant. In relation to medication, I struggled; as all the steroids I tried made me extremely depressed and then came the Azothiprine. I was slowly increased to 100mg a day, however, they then started to give me extreme sickness . I was eventually taken off all medication and surgery was completed. Over the last 12 months, I have had 4 hospital stays. Overall, I have found Blackburn hospital to be very well educated in relation to my complaint. I have had cameras both up and down and many CT scans along with MRI. In relation to triggers, I can't really state for definite - one week some things are good for me the next a flare-up happens. The only mental health issue I suffered with, was whilst I was on the steroids. I do regularly worry about not being able to fully enjoy my life with my 13-year-old daughter and my loving wife. When enduring a flare up I am usually admitted to hospital for pain relief; however, I am now able to self administer morphine at home. Following recent surgery on the bowel, I have yet to really suffer a flare up. What is your go-to routine for when you are flaring? What do you do to give yourself a break or relax? I usually find that relaxing on the sofa or engaging in fun with my daughter and wife reduces the stress and assists in managing the pain. Lifestyle changes have mainly been diet, at first it was a liquid diet and now it is a low fibre diet. I believe I had this condition for about 3 years before I was diagnosed. Being a man, it was embarrassing to discuss bowels with a doctor. I would advise anybody who has any signs at all to not be embarrassed and seek advice early. I am fortunate enough to have a fantastically supportive family. However family members need to let the sufferer do what they think works and not tell them what to do. The thought of one day being able to fully enjoy my life pain free is what keeps me going. My favourite quote in life is “It'll be reet”. This quote is used every day in my battle with Crohn's. Thank you Phil for sharing your story here on BecxBlogs. If you are affected by Crohn's or Colitis; please go to the Crohn's & Colitis UK website for further support and information.